Did divisional-round theatrics produce best playoff weekend in NFL history? A performance authored by a guy making the eighth start of his career. If that wasn't enough to make the second round the NFL playoffs entertaining, New England Patriots quarterback Tom Brady won the 17th playoff game of his career, breaking a tie with childhood hero Joe Montana for the most in league history. Between the tears of Tony Gonzalez, who helped the Atlanta Falcons to an improbable and difficult win over Seattle on Sunday, the historic duel of Ray Lewis and Peyton Manning on Saturday and the record running of San Francisco's Colin Kaepernick against Green Bay and Aaron Rodgers, the NFL may have provided one of the greatest playoff weekends in its storied history. It was almost enough to make fans forget the New Orleans Saints' bounty scandal or the New York Jets' lost season. OK, it wasn't quite that miraculous, but it was certainly dramatic. While the second round of the 2006 playoffs featured three games decided by a field goal (New Orleans beat Philadelphia, Chicago beat Seattle and New England held off San Diego) and the first round of the 2010 playoffs featured three down-to-the-wire games (Jets defeated Colts, Packers defeated Eagles and Seahawks defeated Saints), neither of those years seem to quite measure up to what happened this weekend. "… 'I guess it just wasn't meant to be,' " Gonzalez said after the game, his voice cracking with emotion and his eyes swollen from the tears. "Then we hit one pass, then another." The second of those throws went to Gonzalez, who took it for a 19-yard gain to the Seattle 31-yard line. From there, Falcons kicker Matt Bryant hit a 49-yard field goal as Gonzalez and the Falcons got the playoff monkey off their back. 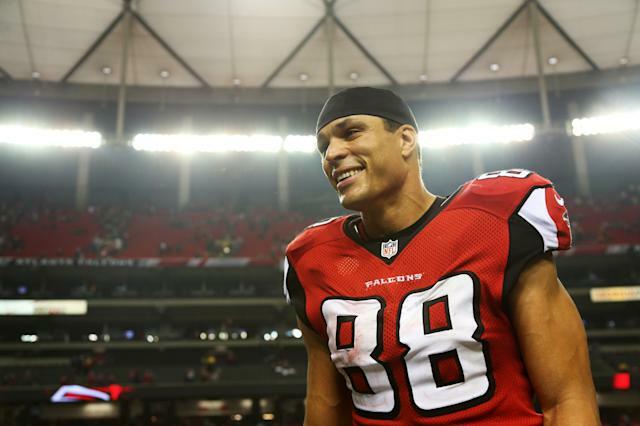 Aside from Gonzalez, the Falcons under coach Mike Smith and quarterback Matt Ryan had yet to win a playoff game. The franchise hadn't been to the NFC championship game since Michael Vick during the 2004-05 campaign. Still, the drama in Atlanta may have been trumped by the Baltimore-Denver game, which went to double-overtime before it ended with a field goal by rookie kicker Justin Tucker. 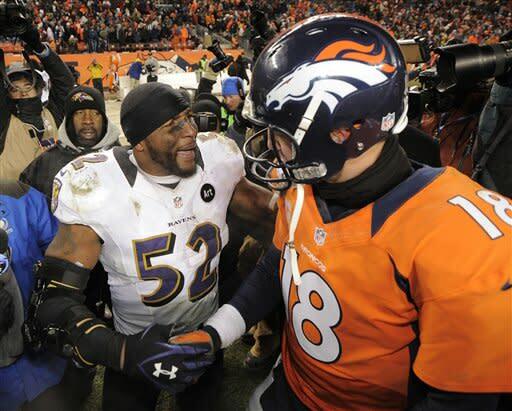 The fact that Lewis' Ravens topped Manning and the Broncos with a game-winning kick seems highly appropriate. Last year, Lewis and Baltimore's chance to get to the Super Bowl for the first time since winning it all 12 years ago was ended when veteran kicker Billy Cundiff missed a short kick. The Ravens now get to return to the AFC championship game with a rematch of last year's game at New England. The Ravens avenged an earlier loss to Denver as Lewis returned to continue to be the emotional leader of the team as he, like Gonzalez, prepares to go into retirement. And while Manning and Rodgers lost, eliminating two of the three best passers left in the playoffs (Brady is the only remaining passer with even a Super Bowl appearance to his name), that didn't mean that there wasn't top-flight quarterback play. In fact, Kaepernick's combination of an NFL record rushing performance for a quarterback (181 yards) and his fine passing (17-of-31 for 263 yards, two touchdowns and one interception) may rank among the top five or 10 playoff performances in league history. All of that set the stage for what should be a fascinating championship weekend.